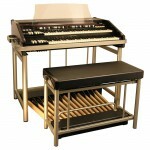 For over 75 years, The Hammond Organ has been the true “King of Instruments”. The Hammond Organ is heard in Churches of every denomination, Concert Halls of every genre, and Recording Studios world-wide. Every corner of music has been touched by the sound of the Hammond Organ, and as familiar as it is, musicians keep finding fresh ways to use it. Audiences and congregations have never tired, or lost their appetite for the singular and unique voice of the Hammond Organ. Within musical instruments it is unequalled and unsurpassed. In the 21st century, The Hammond Organ is alive and well, its tradition preserved by a company whose employees, from the top executives to the newest recruits share the passion this legend inspires. And what a passion it is. 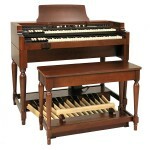 For the devout, what instrument can stir the soul in worship like a Hammond? Gospel music is defined by it. Is there a cooler sound than a Hammond Jazz trio? Rock and Roll might a guitarist’s game, but you must add a B-3 and Leslie to evoke the true soul. Blues and R&B would not be the same without it. Country, Pop, Rap, Polka, Easy Listening, and Ethnic musics from every continent turn to the Hammond when getting to the soul is the target.For over 75 years, The Hammond Organ has been the true “King of Instruments”. The Hammond Organ is heard in Churches of every denomination, Concert Halls of every genre, and Recording Studios world-wide. Every corner of music has been touched by the sound of the Hammond Organ, and as familiar as it is, musicians keep findingfresh ways to use it. Audiences and congregations have never tired, or lost their appetite for the singular and unique voice of the Hammond Organ. Within musical instruments it is unequalled and unsurpassed.In the 21st century, The Hammond Organ is alive and well, its tradition preserved by a company whose employees, from the top executives to the newest recruits share the passion this legend inspires. 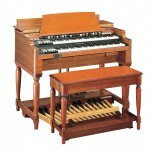 Hammond Organ Company has always built their organs to last, and very many of the original models are still in service. Time marches on, however, and the old soldiers are now starting to show their age. The vintage Hammonds were intricate mechanical wonders, full of thousands of moving pieces; which have become more and more expensive and difficult to maintain, repair, or replace. 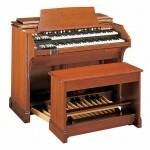 The Modern Hammond Organ Company is privy to the secrets that made those classic organs play and sound that way. Our engineers have harnessed modern technology to express a 77 year old tone, allowing the organist to have the same experience that vintage Hammonds offer. There’s a straight line of development from 1934 to the present day, and although there are “clones” and imitators on the market, none come close to capturing the soul, power, and versatility of the genuine article. Vintage Hammonds are heavy, and not at all able to be modified to an organist’s taste without radical and expensive rebuilding. Modern Hammonds rely on digital technology, without moving parts, substantially reducing weight, allowing each organist to tailor the organ’s characteristics to reflecting subtle variations comprising each musician’s favorite Hammond sound. Those changes can be recalled in an instant, making the modern Hammond one of the most versatile instruments you can play. 1. Harmonic Drawbars-allowing countless variations of tone. 2. Virtual ToneWheels – the digital representation of the classic electro-mechanical generator. 3. Touch-Response Percussion – adds a distinctive highlight that enhances any tone created. 4. Chorus Vibrato – provides the satiny texture found only on a Hammond Organ. 5. A Digital Leslie™ speaker-providing the unique moving sound when a Leslie Speaker cabinet is not available. These features insure that all Hammonds sound as they are from the same family. As twenty-first century Hammonds share these features with the highly-prized vintage models, it is clear that they are the same family. You can choose a new Hammond with complete confidence that your organ is the finest sounding, finest playing Hammond ever built. Another facet of Hammond that has never varied from 1934 to today is the commitment to quality of manufacture, and dedication to customer service. Innovative and efficient design allows a quick and easy solution to the rare service issue, and our staff is always a telephone call or email away. Buying a new Hammond is always a cause for celebration. Few instruments command such devotion, and instill the thought that you truly made the right purchase. In many communities, the passing of Hammond Organ music down from generation to generation is a birthright. Your Mom and Dad played the Hammond, and you do, too. Hammond-the sound, the soul, the ONE!